The cell is the building unit in all living organisms. Cells are characterized by their ability to grow, reproduce, respond to external stimuli and perform the different metabolic processes. The cell is made up of a protoplasmic mass surrounded by the a cell membrane. The protoplasm is differentiated into a nucleus and cytoplasm. Cytoplasm contains a group of cellular structures called cell organelles. The nucleus is the most prominent organelle in the cell that you can see under a microscope. It often has a spherical or oval shape and is located in the middle of the cell. It is surrounded by a double membrane called the nuclear envelope. The nuclear envelope separates the contents of the nucleus from the cytoplasm. There are several tiny pores in the nuclear envelope through which substances pass between the nucleus and the cytoplasm. The nucleus contains a transparent gelatinous fluid called nucleoplasm. The nucleoplasm contains minute tangled threads, coiled around themselves, called chromatin. The nucleus also contains another structure called the nucleolus. The cell nucleus may contain more than a nucleolus, especially in the cells responsible for forming and producing the protein substances such as enzymes, hormones and so on. During cell division, chromatin gets changed into rod-like structures called chromosomes. Chromosome appears in the metaphase of cell division and consists of two threads joined together at a central part called the centromere. Each thread of these two threads is called a chromatid. Each chromatid is composed of nucleic acid DNA coiled around molecules of proteins, called histone. DNA carries the genetic information that controls the shape and structure of the cell and organizes the vital activities of the living organism’s cells. All of your body traits are inherited from your ancestors, and you inherited them when copies of the stored genetic material were made during reproduction. The cytoplasm is a fluid-like substance present between the cell membrane and nucleus. It is mainly composed of water as well as some organic and inorganic substances. It contains a network of threads and microtubules that help the cell to maintain its shape and form. This network is called the cytoskeleton. The cytoplasm also contains a group of various structures known as cell organelles. Some of these organelles are not surrounded by a membrane and are called non-membranous organelles, such as ribosomes and centrosome. Other organelles are surrounded by a membrane and are called membranous organelles, such as endoplasmic reticulum, Golgi apparatus, mitochondria, lysosomes, vacuoles, and plastids. Ribosomes are round-shaped organelles that synthesize protein in the cell. Some of them are present in the cytoplasm (single or in clusters) where the protein is produced and are directly released into the cytoplasm. The cell uses them in its vital processes such as growth, regeneration, and so on. Most ribosomes are attached to the outer surface of the endoplasmic reticulum and produce the proteins transferred by endoplasmic reticulum to the outside of the cell (such as enzymes). Animal cells and some fungi cells (except for nerve cells) contain two tiny particles called centrioles. These are located near the nucleus in a region of the cytoplasm. This region is called the centrosome. The centrosome is not present in plants and some fungi cells. These cells contain a region of cytoplasm to conduct the same functions instead. 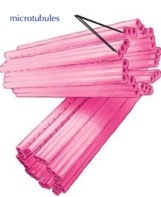 Each centriole is composed of nine groups of microtubules, ordered in triples in a spherical shape. The centrosome plays an important role during cell division where the spindle filaments extend between the centrioles present at each pole of the cell. The centrosome also plays an important role in forming the flagella and cilia. The endoplasmic reticulum is a network of membranous canaliculi that extends in all cytoplasm. It is attached to the nuclear envelope and cell membrane. It forms an internal transferring system that transfers the substances from one part to another inside the cell and so transfers the substances between the nucleus and the cytoplasm. Ribosomes are absent from the smooth endoplasmic reticulum. This is specialized in synthesizing lipids, transforming glucose into glycogen, and modifying the nature of some toxic chemicals in the cell to reduce their harmful effects. Golgi apparatus are a series of flat membrane-bound sacs. The numbers of Golgi apparatus differ according to the cell’s secretion activity. Golgi apparatus are specialized for receiving the molecules of substances secreted by the endoplasmic reticulum across a group of transporting vesicles. Then, it classifies and modifies these vesicles and distributes them into the places where they are used in the cell. 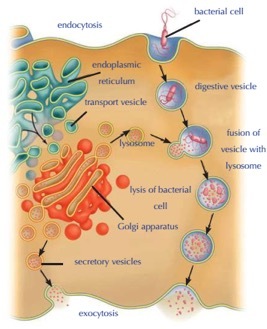 Golgi apparatus may also pack the molecules inside secreting vesicles called lysosomes, which move forward to the cell membrane as the cell dismisses them outside as secretory products. Golgi apparatus are named after their founder, Italian anatomist and pathologist Camillo Golgi, who described them for the first time in 1898. This organelle is also known as the Golgi complex, and dictyosomes in plants and algae. Lysosomes are small, round, membranous vesicles formed by Golgi bodies. They contain a group of digestive enzymes. The lysosomes’ function is to get rid of worn and senile cells and organelles which no longer have benefits. Furthermore, lysosomes digest the large molecules of nutrients engulfed by the cell and change them into structurally simpler substances to enable the cell to benefit from them. For example, white blood cells use the digestive enzymes present inside the lysosomes to digest and destroy the pathogens which invade the cell. The cell is not affected by the lysosome enzymes because these enzymes are surrounded by a membrane, isolating them from the cell’s components. Mitochondria are sac-like membranous organelles. Their walls consist of two membranes. A group of folds, known as cristae, extends from the inner membrane into its matrix figure 18. These cristae work on increasing the surface on which the chemical reactions producing the energy take place. Mitochondria are considered the main storehouse for the respiratory enzymes in the cell. They are also considered a storehouse for the other substances needed to store energy resulting from respiration (due to the oxidation of the nutrients, especially glucose). The energy resulting from respiration is stored in the form of a chemical compound called adenosine triphosphate (ATP), from which the cell can extract energy once more. The vacuoles are membranous sacs (similar to bubbles filled with a liquid). They store water, nutrients, and the waste materials of the cell until it gets rid of them. The vacuoles are small and large in number in animal cells, while they are collected in one big vacuole (or more) in plant cells. The plastids are various shaped membranous organelles present in plant cells only. There are three types of plastids that differ from each other in regard to the pigment present in each type. White plastids or Leucoplasts: these are plastids that don’t contain any type of pigments. They work as centers for storing starches. They can be found in the roots of sweet potatoes, stems of potatoes and the internal leaves of cabbages. Chromoplasts: these are plastids that contain carotenoids, which are coloured red, yellow and orange. This type of plastid is extensively spread in the petals of flowers, fruits and in the roots of some plants such as rapeseed. Chloroplasts: these are present in the leaves and stems of green plants. They contain chlorophyll that transforms the light energy of the sun into chemical energy in the form of glucose through photosynthesis. Chloroplasts are composed of a double envelope surrounding a matrix called the stroma. The stroma contains layers of disc-shaped, compact structures known as thylakoids. Each group forms what’s known as the granum.